Weia Reinboud holds National masters records in triple jump, javelin throw and pole vault. Her first world record high jump was at the age of 50. She has participated in heptahlon, high jump, triple jump, hammer throw, javelin throw and pole vault but concentrates now on high jump and javelin for time reasons. In August 2013, Weia restarted training for the multi events, in 2014 her first heptathlon, and in 2015 turned 65. Mid-2015, Weia will try to improve the world record in the heptathlon in the Women 65 age group - tough, but not impossible. Then improve the world record high jump indoors, in summer the outdoor record will follow, and then the javelin record. Photo just after Weia's last world record on March 4 2012 where she jumped 1.46 high. Picture by Ed Turk. How and why did you decide to become a vegan & How long have you been vegan? Autumn 1982, so just over 30 years ago. Being vegetarian, I (we) supposed there were no slaughter houses necessary for me (us) but spring 1982 we read an article about the killing of calves to keep the milk 'giving' going. The conclusion of that article was that some meet eating was OK, but we took the contrary conclusion, that no dairy products were OK. It took half a year to change our eating habits. At the time we did not know of veganism and there being others eating like that, we in a sense reinvented it. I just like to be vegan, to have a life style that ethically fits me. 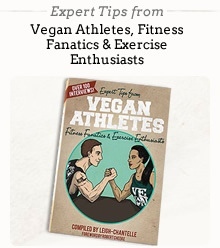 It's very difficult to say whether veganism and sports is a better combination than non-veganism and sports. It asks for difficult double blind statistical studies... Long ago, my mother was running an institute offering cooking courses etcetera. One was for vegetarians and the instructor said she found those vegetarians so weak and pale, which could be her prejudice or just the situation for those needing cooking courses. My personal experience is completely different. I am giving high jump training and all my pupils are much younger, around forty years. We all do the same stuff and of course they have the strength of youth. But things like aching muscles seem to be the same and when my recovery takes a bit longer age is the explanation. Veganism is one of those choices you make and never regret. When you see cows in a meadow with enormous udders you can say 'sorry girls, I'm not the cause'. Besides you have other advantages, you have a much smaller ecological footprint etcetera. I cannot see any disadvantage, you feel happy by living according your own choices and more important: these are ethical choices. The mainstream consumer searches for happiness in the act of consuming, but the ethical consumer consumes less and finds more happiness! This is the case for all ethical choices and veganism is the biggest of them. What sort of training do you do & What sports do you play? Three times a week is the basics; some simple fitness stuff is added to that. I am the high jump trainer at our athletics club. The biggest misconception is that veganism is a diet that leads to dull meals. The best way to combat that is to serve an extremely nice vegan meal! See above. Difficult to say without research. Well, without research... There are three possibilities: as a vegan athlete, you are a better, equal or worse athlete compared to when you weren't vegan. I like to be modest about my accomplishments but it is the case that I am best of the world in my first discipline, the high jump, and one of the best of Europe in my second discipline, throwing the javelin (at this moment European champion in my age group). I do not know how much food adds to these successes, if any. But, it safely can be said that it is possible to sport at the highest level as a vegan. In talking about sports and food it often is said that you need meat and milk and whatsoever. I can easily say that it’s possible to do without, just a smile is enough. And because they know of my records they see they in fact have no point. Last week I had a nice experience. The yearly meeting of all writers on the website of the national athletic federation is coming and after the meeting they are going to dine together. Nasty things, not organic too. I said I wouldn't join, being vegan for thirty years and two months and one of the vegetarians of the group immediately reacted with 'proud of you', he himself only being vegetarian. That's supportive! They wouldn't be friends if not! People can ask about Protein. I personally very much like proteins. Nuts are one source, but I do not really like nuts, I hardly take them. Beans are another rich source and I especially eat beans in the right season: butter beans, fresh marrowfat peas etcetera. But, mostly I eat them as vegetables and like to have a 'real' protein product added. Here tofu is my favourite. I know tofu since I was 15 or so, as it is a common ingredient in Indonesian cooking (where it's called tahu), which I love since my mother did a course in it. Tofu can be found in many prepared burgers or so, but I always prepare it myself. Indonesian style or otherwise, a meal without tofu or sometimes tempeh can hardly be called a meal! Athletes need enough proteins and as I do not experience problems in recovery tofu seems to be a sufficiently good source. There is always enough internal and intrinsic motivation to have no need for other outside motivators. Breakfast - First breakfast: fruit. Second breakfast mostly a leftover of the day before, Italian pasta, Indonesian rice, and Dutch potatoes. Dinner - Salad quite a lot, pasta/rice/potatoes, many vegetables, tofu or tempeh or sometimes beans. 100% organic by the way, since 29 years. Snacks (healthy & not-so healthy) - Potato chips (fried in olive oil, less salty than normal), chocolate. Protein - Tofu in many kinds. Calcium & Iron - I never think about calcium or iron, it will be in the vegetables etcetera. Gaining muscle - High jumpers don't like too much muscles... However, I am a typical high jumper, I simple am not muscled and training with weights leads to better muscles, not more. Losing weight - Eat (a bit) less. Maintaining weight - Eat enough. Improving metabolism, Toning up - Never felt a need for that. By just being there. I (we) have written quite a lot about it, so we have inspired others. Sorry, almost everything in Dutch. Feel free to contact me through my personal website. I also have an article (with English translations) on Freedom (PDF) and if interested, see my photos on tiny creatures.